One of my Facebook friends shared an easy recipe from Inspired Dreamer that looked too good to pass up! I’ve made Pineapple Upside Down Cake many times in the past, but I’ve never made it in a cupcake form until now. Plus this recipe uses cake mix which is something I’ve been doing a lot lately with my small collection of cake mix hack recipes. I figured I’d try it out too and see how it turned out for me. I was only able to get 18 cupcakes out of this particular recipe vs. the 24 cupcakes from the original. I think they would have been too small had I tried to spread everything out to fit the 24 muffin tins. They bake upside down just like the cake version. 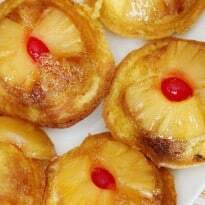 The brown sugar and butter mixture caramelizes over the pineapple slices and cherry creating a sinfully sweet topping. The cake mixture is incredibly moist and pineapple flavoured thanks to the addition of the juice leftover from the can. I was curious to see how easy they would be to remove from the muffin pan. It was surprisingly easy. I had to loosen a few around the edges with a butter knife, but most of them plopped right out for me still intact. They are a bit retro looking don’t you think? They turned out beautifully. Each glorious bite is something meant to be savoured. 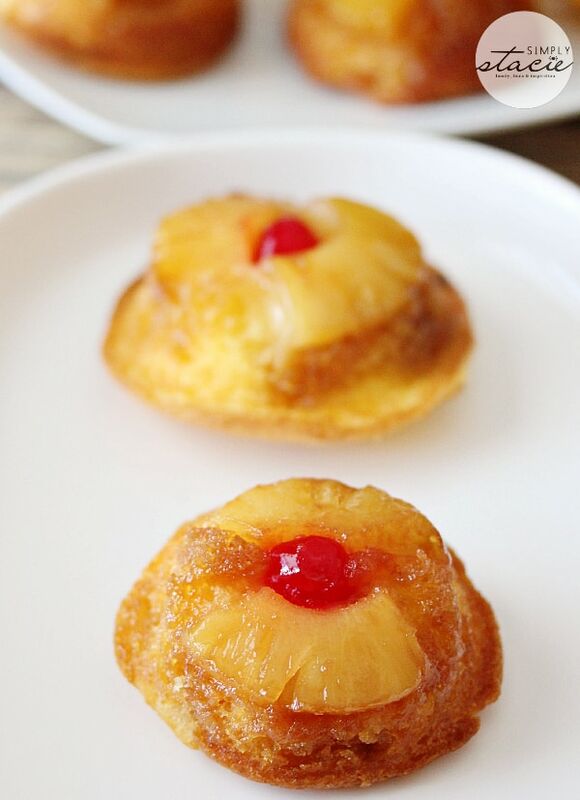 If you love the traditional pineapple upside down cake, try the muffin version. It’s an incredibly easy recipe that my whole family enjoyed! You might also like this Pineapple Pie. 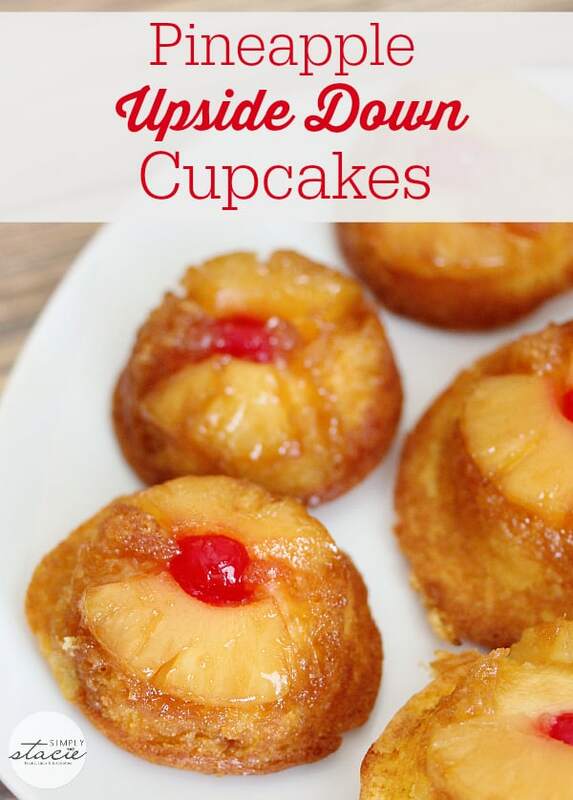 Try this super simple Pineapple Upside Down Cupcakes recipe made with yellow cake mix! Preheat oven to 350F. Spray muffin tins with cooking spray. Set aside. Add cake mix, vegetable oil, pineapple juice, eggs to a large bowl and beat with an electric mixer on medium speed until smooth. In another bowl, stir together brown sugar and butter. Add a small spoonful of sugar mixture to each muffin tin. Then add two pineapple slices to each muffin tin followed by a cherry half with the cut side up in the centre of the pineapple slices. Add cake batter to each muffin tin. Bake for 20 minutes or until a toothpick comes out clean from the middle of the cupcakes. Let cool for a few minutes and then invert on a baking rack. It looks delicious! Our stayed with mouth watering. I want to try to do it. If this mixture of yellow cake mix is ready for cake, the kind that comes in the box? I live in Brazil. Sorry I used the Google translator. Yes, it’s the boxed cake mix. 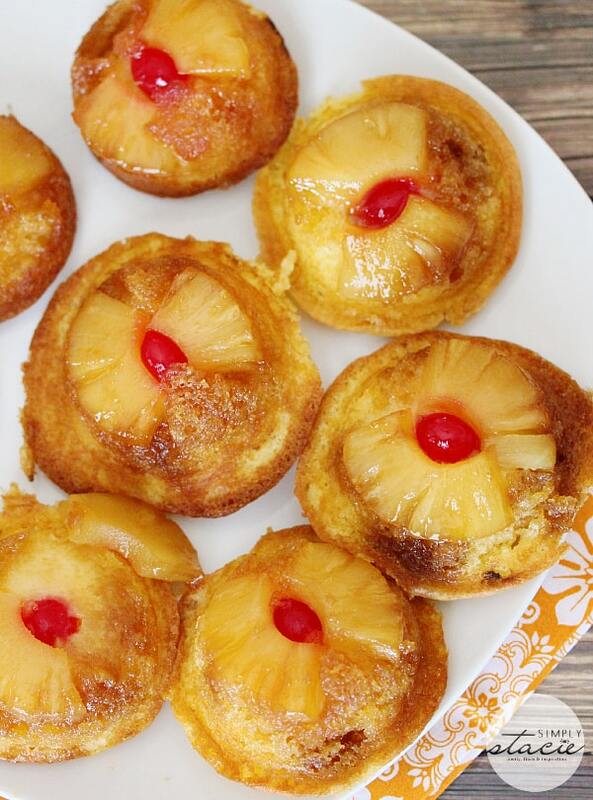 I have never made Pineapple Upside Down Cake in muffin tins but it is a great idea, will have to try it out. Thanks for sharing! I love the idea of updating the recipe to smaller sized portions from the cake! Very good! These are too cute! I love pineapple when baking…. 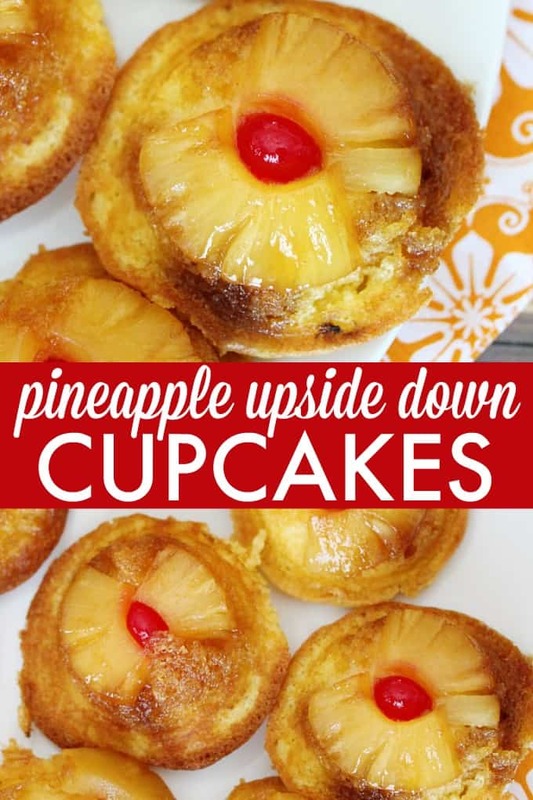 I’ve always wanted to make pineapple upside down cake but I may start with these cupcakes, thanks! I remember making upside down cake in cookery class at grammar school, from scratch mind you and boy is that way back when. We also had sewing, knitting etc. I don’t think these things are taught any more, more’s the pity. This is a great idea, making them in a muffin tin, I’m going to do this the next time I make an upside down cake!! These look absolutely delicious. I am so making these this weekend. Thanks so much for sharing the recipe. How creative! My husband would love. Thanks for the tip on only doing 18 instead of 24….you don’t want them too small. I printed this out and am going to the store tomorrow to buy the cherries and canned pineapple. I have a question tho, since you use the juice from the can I don’t know what size can to buy. What size canned pineapple does this recipe call for? I don’t want to the use the wrong amount of juice. They look great! I love pineapple upside down cake, so I’d love to try this recipe next time I bake. What a lovely treat to find at Full Plate Thursdays. I can’t wait to try these. I hope you will come visit and share at my weekly party “What’d You Do This Weekend.” It runs Monday-Friday. I just love your special little Upside Cupcakes! Thanks so much for sharing your talent with Full Plate Thursday. Wishing you a Valentine Day filled with Love! These look amazing! I haven’t had Pineapple Upside Down Cake in soooooo long 🙂 Pinning this recipe! I have loved pineapple upside down cake since my mil introduced it to me 31 years ago!Gonna try these cupcakes for sure! Thanks for sharing at the DIY Inspired Link Party! Holy-Moly these look amazing! Enjoy your week! OMGosh, this looks delicious… I will have to try it this weekend. Thanks for the recipe! These look yummy! 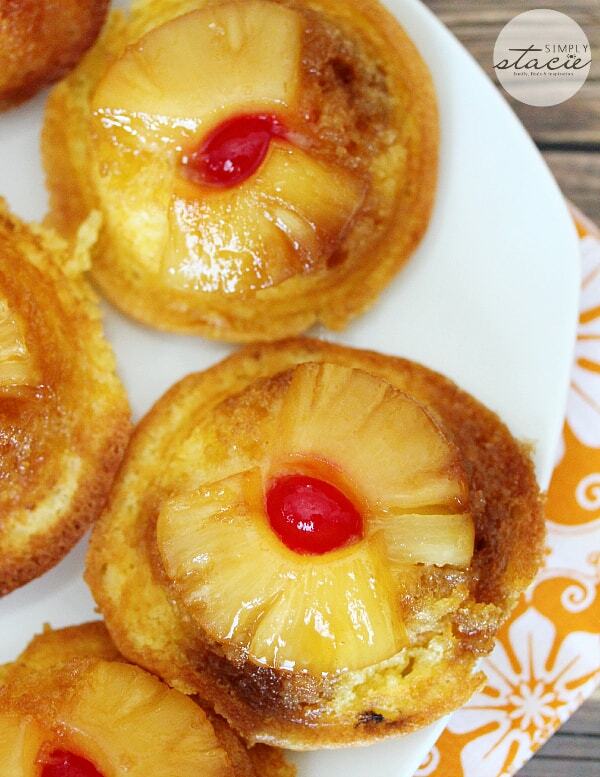 I love Pineapple Upside Down Cake but never thought about making it in cupcake form. Since I have everything needed I’m going to try this tomorrow. Pingback: 53 Positively Perfect Pineapple Recipes & Crafts - Frugal Mom Eh!